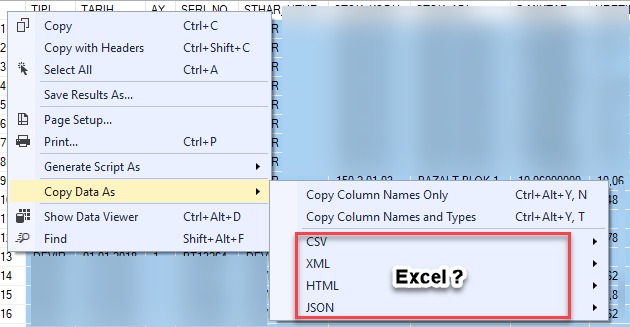 Can the addition of Excel (xlsx) format to the Copy As Data field make it a more useful tool? They are asking for the ability to copy the results grid in the Excel format, preserving the value type formatting (i.e. VARCHAR as Text, INT as Number, etc). It handles pretty much all data types as you would expect them to when trying to copy from the results grid into EXCEL. I work with a lot of client data containing UPCs, which often have leading zeroes. When copying into excel as text, it will often try to convert them into a number format, which drops the leading zero. One other big thing it does is automatically converts NULL values to blanks. When you deal with both SQL and Excel all day, it's a huge time saver. We collect and analyze the information from this forum in order to make a proper roadmap for the future product releases.